Arduino would have been the first board for many hobbyists (including me) and engineers out there when they started with electronics. However, as we start building more and dig deep we would soon realise that Arduino is not industry ready and its 8-bit CPU with a ridiculously slow clock, it does not give you enough juice for your projects. Hopefully though, we have the new STM32F103C8T6 STM32 Development Boards (Blue Pill) in the market now which can easily outperform Arduino with its 32-bit CPU and ARM Cortex M3 architecture. Another honey pot here is that we can use the same old Arduino IDE to program our STM32 Boards. 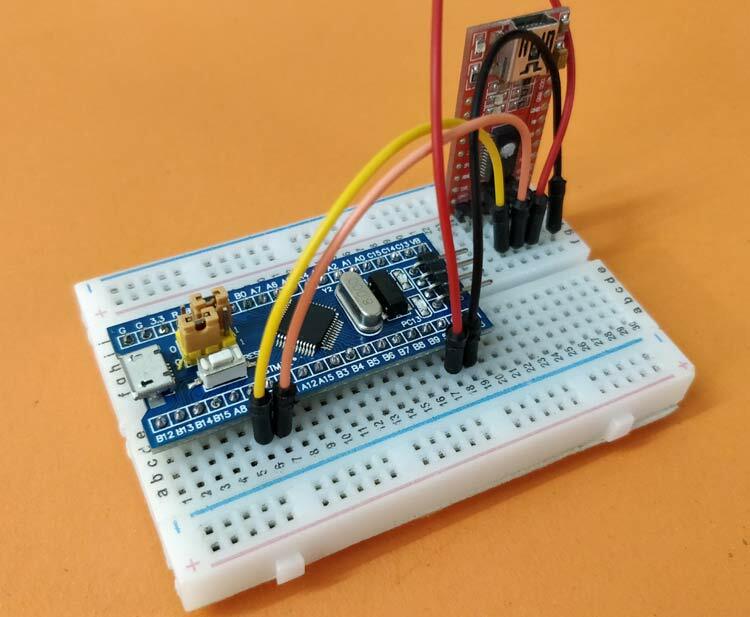 So in this tutorial, let us get started with the STM32 to know a bit of basics about this board and blink the on-board LED using the Arduino IDE. The STM32 board a.k.a Blue Pill is a Development board for the ARM Cortex M3 Microcontroller. It looks very much similar to the Arduino Nano but it packs in quite a punch. The Development board is shown below. These boards are extremely cheap compared to the official Arduino boards and also the hardware is open source. The microcontroller on top of it is the STM32F103C8T6 from STMicroelectronics. Apart from the Microcontroller, the board also holds two crystal oscillators, one is an 8MHz crystal, and the other is a 32 KHz crystal, which can be used to drive the internal RTC (Real Time Clock). Because of this, the MCU can operate in deep sleep modes making it ideal for battery operated applications. Since the MCU works with 3.3V, the board also houses a 5V to 3.3V voltage regulator IC to power the MCU. Even though the MCU operates at 3.3V most of its GPIO pins are 5V tolerant. The pin of the MCU are neatly pulled out and labelled as header pins. There are also two on-board LEDs, one (red colour) is used for power indication, and the other (green colour) is connected to the GPIO pin PC13. It also has two header pins which can be used to toggle the MCU boot mode between programming mode and operating mode, we will learn more about these later in this tutorial. Now few people might be wondering why this board is called as “Blue Pill”, well seriously I do not know. May be since the board is blue in colour and can give a boosted performance to your projects someone came up with this name in it just stayed. This is just an assumption and I have no source to back it up. The ARM Cortex M3 STM32F103C8 Microcontroller is used in the Blue pill board. Unlike the name, “Blue Pill” the Microcontrollers name STM32F103C8T6 has a meaning behind it. Now let us look into the specifications of this Microcontroller. If you want to know more on technical features of the Microcontroller then you can refer to its Datasheet. You might also be interested in the Reference manual and the Errata sheet of the Microcontroller as well which is also linked. The complete pin-outs of the STM32 Blue pill board is shown below. As you can see each pin is neatly labeled against it. The labling is also similar to the Arduino boards. That is the G is used to denote the ground pin, 3.3V outpus a regulated 3.3V and the 5V pin can either be used to power the board or obtain the +5V if powered via micro USB. The on-board LED is connected to the PC13 pin of the Microcontrller. Unlike Arduino boards, the STM32 development board has to be manually set to programming mode using the boot 1 and boot 0 jumper wires. The position of Boot 1 is normally not disturned. But the boot 0 jumper has to be set as 3.3V for programming mode and set to ground for operating mode. We will learn more about it when we upload the program on our board. The STM32 is just another microcontroller form the STMicroelectronics family. So all the existing methods to program an ARM chip can be used for the STM32 board as well. One famous and commonly used IDE is the Keil ARM MDK and apart from that we can also use IAR workbench, Atollic TrueStudio, MicroC Pro ARM, Crossworks ARM, Ride 7, PlatformIO+STM32 etc. But what made this board a lot popular is its ability to be programmed with the Arduino IDE. This way people can get started and build projects with STM32 in no-time since many will be familiar with Arduino IDE and its easy to use programming language and readily available libraries. So in this STM32F103C8T6 Arduino IDE tutorial we will using the Arduino IDE to get started with STM32. To program the STM32 Blue Pill board directly from Arduino IDE we need to use a Serial FTDI board. This board is connected to the Rx and Tx pin of the STM32 as shown below. The Vcc pin of the FTDI board is connected to the STM32 5V pin of power the board. The ground is connected to the Ground of STM32. The Rx and Tx pin of the FTDI board is connected to the A9 and A10 pin of the STM32 respectively. Where the A9 is the Tx pin of STM32 MCU and the A10 is Rx pin. Now you might be wondering why we are not using the micro-USB port to program the board just like any other Arduino boards. Well!! actually we can but for this tutorial we chose not to. The STM32 Blue Pill development board when purchased does not come with a bootloader to make it Arduino IDE compatible. Howerver this bootloader can be flashed into the STM32 board and then the micro-USB port can be directly used to upload the programs. But at the time of documenting this article the bootloader has some bugs and is currently still under development. Follow the below steps to download and prepare the Arduino IDE to be used with the STM 32 Development board. Step 1:- If you have not yet installed the Arduino IDE, download and install it from this link. Make sure you select your correct operating system. Step 2:- After Installing the Arduino IDE open and download the required packages for the STM32 board. Thi can be done by selecting File -> Preferences. Step 4:- Now go to Tool -> Boards -> Board Manager. This will open the Boards manager dialog box, search for “STM32F1” and install the package that appears. Step 5:- After the package, installation is completed. Go to Tools and scroll down to find the Generic STM32F103C series as shown below. Then make sure the variant is 64kFlah type, CPU speed is 72MHz and change the upload method to Serial. Now the Arduino IDE is ready to program the STM 32 Blue Pill Development Boards. In the example program that opens, we have to make a small change. By default the program will be written for PB1 but on our board the on-board LED is connected to PC13 so replace all PB1 with PC13 and we are good to proceed. The complete example program which is modified can also be found at the bottom of this page. The code inside the loop function alone is shown below, where we can notice that the PC13 pin is kept HIGH (on) for 1000 millisecond and then turned LOW (off) for another 1000 millisecond and this is done for infinite times since it is in loop function. Thus the LED appears to be blinking with an interval of 1000 millisecond. As told earlier the STM32 Board has to be put into programming mode before uploading any program, to do this put the boot 0 jumper in the lower position. The Jumper position for Programming mode and Operating mode are shown below. Now, to upload the program make sure the boot 0 jumper is in programming mode as shown above and then press the Reset button. As soon as you press the reset button the board will enter into programming mode and the green LED will be turned off, this indicates that the board is ready for upload. Press the upload button on the Arduino IDE and your program should get compiled and uploaded. If everything has worked as expected then you should see the following on yor Arduino IDE console. Note: Sometimes the Arduino IDE will show done Uploading even if the program was not uploaded successfully. So drag open your console to check the write address percentage (orange colour text) to make sure the Upload has been done successfully. If the Program has been uploaded successfully then you should see the Green LED blinking at a 1 second interval as shown in the video below. You can also fiddle around with the program to increase or decrease the delay. After uploading the program the boot 0 should be changed back to operating mode so that next time when the Board is powered the uploaded program starts to get executed automatically. The programming mode and operating mode positions are shown in the above image. Hope you understood the tutorial and found it useful to get started with STM32 Board. If you have any problem leave them in the comment section, also tell me what projects we should try with this STM32 board. You guys should try to use inertial sensors with this stm32 and arduino. I think its a very good project to develop. "Now few people might be wondering why this board is called as “Blue Pill”, well seriously I do not know. May be since the board is blue in colour and can give a boosted performance to your projects someone came up with this name in it just stayed. This is just an assumption and I have no source to back it up." Because there was also one in red color PCB. So someone name them with name of the pills from The Matrix (movie): Red Pill and Blue Pill.